This ain't no April Fool's joke. Pet Graveyard is coming this spring to wreck havoc on your ribcage while giving you the worst kind of deja vu. It's a schlockbuster of the worst kind, and the first trailer and poster have crawled out of the worm-filled ground to give you the willies as we kick off another week in February. 'The Space between life and death can kill.' That surely sounds like a tagline Paramount could be using for its upcoming Stephen King remake Pet Sematary. Though Pet Graveyard isn't a direct spoof of that anticipated horror thriller, it might as well be. The similar sounding name is meant to throw consumers off the path, and that poster would be almost identical if it weren't a Siamese Cat at the center of attention. This is the alternate reality version of the classic story told in a really muffed up way. Pet Graveyard stars Jessica O'Toole, David Cotter, Rita Siddiqui, Hindolo Koroma, Kate Milner-Evans, Georgina Jane, T'Jean Uter-Dinh, and Hattie Willow. The movie is scheduled for release on dvd/digital on April 2nd, so it's not a straight up April Fool's joke. Thoug it might as well be. Uncork'd Entertainment is handling worldwide distribution. 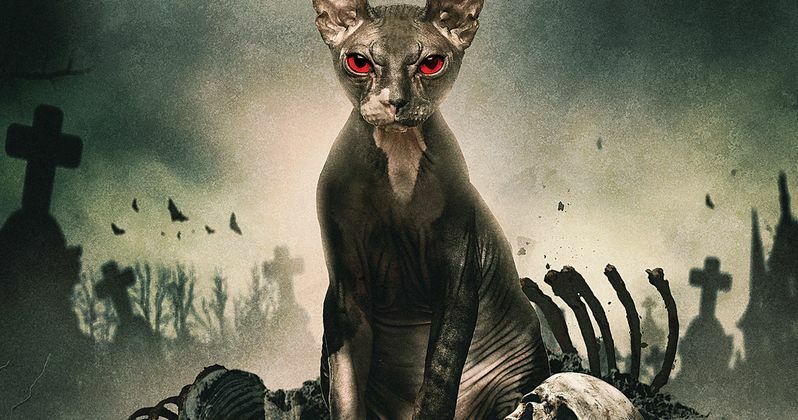 Stephen King's Pet Sematary remake is arriving in theaters just a few days later on April 5, so it's no coincidence that the filmmakers behind Pet Graveyard are rushing their product to shelves, hoping to be the Pepsi to Paramount's Coke. But just one look at the trailer indicates that it won't be hard to distinguish the two films. This comes on more like President's Choice soda than it does RC or even Shasta. It's a pretty blatant knock-off put on store shelves only to confuse and confound consumers. In the new Pet Sematary, Dr. Louis Creed and his wife, Rachel, relocate from Boston to rural Maine with their two young children. The couple soon discover a mysterious burial ground hidden deep in the woods near their new home. When tragedy strikes, Louis turns to his neighbor Jud Crandall, setting off a perilous chain reaction that unleashes an unspeakable evil with horrific consequences. The movie gets in a twist, making it the daughter that dies and comes back to life, so its not even playing striating with the mythology of it all. So if you're into dead pets and kids and have a thing for the Grim Reaper, the first week of April will be your favorite time of year. You can check out the knockoff poster courtesy of October Coast.